Having recently been set a challenge by Warburtons which was to create a healthy sandwich using their Sandwich Thins, here's my sandwich! 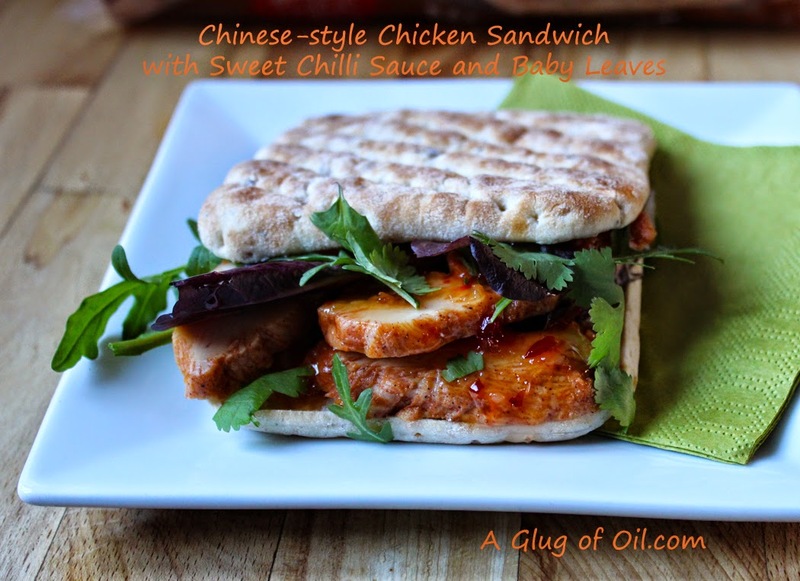 Chinese-style Chicken with Sweet Chilli Sauce and Baby Leaves tucked between Warburtons Seeded Sandwich Thins. Healthy and delicious. 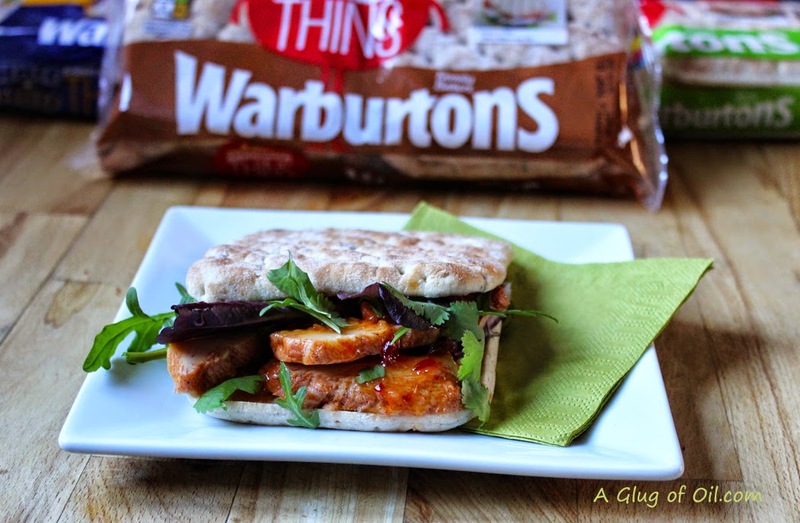 Warburtons sandwich thins are available just 100Kcal per thin. They're pre-sliced too which makes them ideal for rustling up a super quick sandwich. There are four varieties to choose from; white, brown, seeded and half and half. Assemble the sandwich layering chicken sweet chilli sauce and the salad and coriander leaves - and enjoy. • Contrast is king with sweet and spicy flavour combinations tipped for food fame. • Creative sandwiches are fast picking up pace using alternative bread bases with adventurous fillings. • With the rise of generation Z, technology will take centre stage for all things food related. Warburtons, in collaboration with the nation’s leading food experts, including The Food People and Food Futurologists, The Robin Collective, have created the ‘Top Ten Food Trends’ set to dominate in 2015. In 2014 we were a nation of truffle foragers who couldn’t get enough of the superfood buckwheat. It was the year of consumer creators as we became ‘at-home-chefs’ and street food took the country by storm. 1. Sweet and spicy mix up: Look out for the likes of jalapeno honey and ghost chilli honey topped on chicken-and-waffles, whipped into butter, mixed into salad dressings, snuck into sauce. It started with salted caramel but this year the idea of subtle clashes in food will become the norm. 2. A nation of grazers: Quick, portable and smaller portioned foods on the go are replacing traditional meal occasions with the continued popularity of street food testament to this trend. 3. Beneath the surface: Carrots are the new pork belly, cauliflower the new steak, winter kale the new burger. Vegetables, no longer the supporting players in restaurant meals, now have the starring roles. Watch out for parsnips making a come back and kohlrabi, part of the cabbage family, rising in fame. 4. Creative sandwiching: Adventurous sandwiches will pick up pace in 2015 as consumers think outside the (lunch)box to add flair, not calories to their meal and enjoy food their way. Sandwich alternatives such as thins are hot property this year as they complement this growing trend offering consumers a versatile canvas to add exciting flavour fillings at 420 KJ / 100 Kcal per thin. 5. Breakfast evolution: Taken on-the-go during the week and ‘out-of-hours’ at the weekend, the most important meal of the day is either healthier, quicker and convenient or long and leisurely. Portable foods like yogurts, breakfast sandwiches and fruit are in huge demand. When looking at breakfast eaten out, everyday ‘home style’ breakfast products are on the rise as shown by Brixton’s popular Burnt Toast eatery where consumers are invited to toast their own bread. 6. Search, eat, share: As generation Z make themselves known, technology will become a core fixture of food occasions. Whether it's the restaurant experience, the ordering process or social sharing of food, a side of technology will be a must-have. 7. Manipulation: Prepare for adjustments in restaurant environments and the way food is served, as foodies play with our senses and manipulate the way the brain tastes and interprets food. Diageo found that if you drink a glass of single malt in a room carpeted with real grass, accompanied by the sound of a lawnmower and birds chirping, the whisky tastes "grassier". 8. Noodles: The speed, ease, tastiness and value for money that noodle based dishes offer will see the love of noodles continue in 2015. Bone Daddies Ramen Bar hit London by storm recently showing just how popular noodle have become. 9. Rising Stars: Just as dining is becoming less and less formal, so too do we look less to the old guard of cooking, and look more to the young, exciting cooks. Shaping how and what we eat over the next few years will include Florence Knight at Polpetto, Marianne Lumb of Marianne and Daniel Doherty, head chef at Duck and Waffle, who published a book this year and is pushing a great number of boundaries in the kitchen. 10. Back to the future: Childhood food formats that are deliberately re-invented in an adult form – from milkshakes to fish finger sandwiches. Childhood food rituals are coming back. You can find more information on Warburtons great range of products over at the Warburtons website. Disclaimer: I was sent the range of Warburtons Thins along with a supermarket gift card to buy ingredients. I was asked to make a recipe and I was compensated for my time. Looks like a lovely sandwich! I haven't tried these sandwich thins yet, but at 100kcal a slice they are tempting! Looks tasty... I do think however this concept is a wheeze to get folks to pay more for less product!! I do enjoy eating them though. I love these thins, I make them into little pretend, healthier pizzas. They feel like a treat without being too calorific! I've not tried the thins yet, looks handy for making a quick sandwich though. Chinese chicken sounds like a tasty filling too. Yum. I made some sweet chilli sauce this weekend and Mark has been putting it on everything, so I'll be showing him this to add to his repertoire!